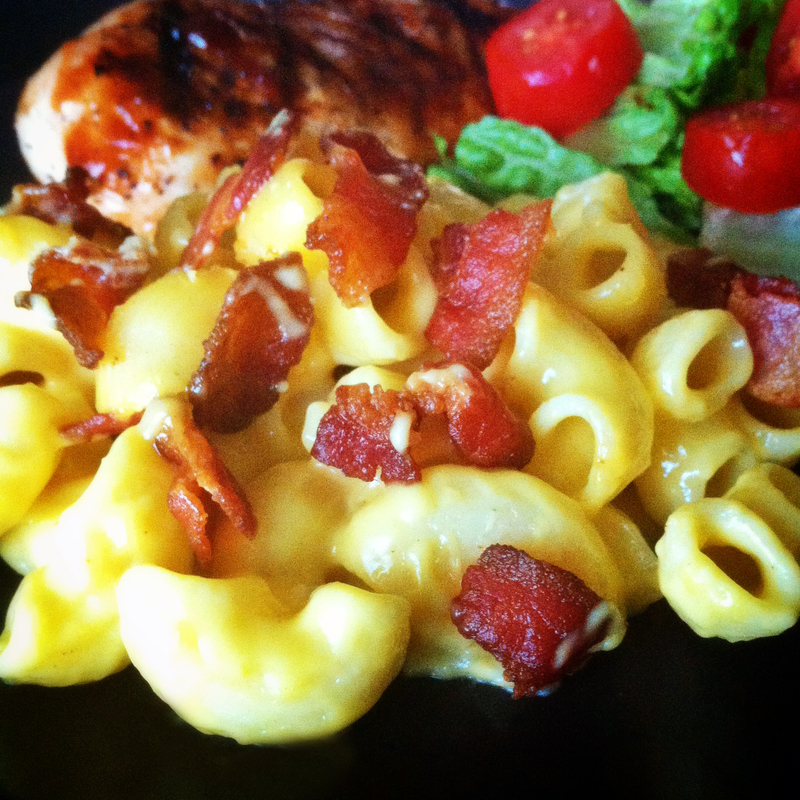 bacon mac n’ cheese | omfg. so good. I love looking at photos of food. And watching t.v. shows about food. And reading blog posts about food. One thing I’ve noticed lately though, is that everyone is trying to out do each other with off-the-wall flavor combinations using things like kale, scape and quinoa. I appreciate the originality, but sometimes don’t you just crave something comfortable and classic? I guess maybe I’m a bit old-school when it comes to comfort food. No, I’m not talking navy blazer with pleated khaki Dockers old-school. But if it ain’t broken, why try to fix it? Unless by fixing it you mean adding bacon. Let me just preface with this, what you’re about to read isn’t a fancy recipe for mac n’ cheese. So if that’s what you’re in the market for you might as well leave now and go Google “five cheese whole grain pasta bonanza” or some other similar nonsense. In a medium saucepan, boil pasta according to directions and drain. Transfer to large casserole dish and set aside. Using kitchen shears, snip bacon strips to small pieces and cook to desired crispness. Drain on a paper towel and set aside. Shred the colby jack cheese and cut the Velveeta into small cubes. In a medium saucepan, melt the butter then add the flour and whisk to combine. Cook for 2 – 3 minutes to a loose paste like consistency. Slowly add the milk and whisk to combine. Add in the garlic powder, pepper, cayenne pepper, salt, and mustard and whisk to combine completely and thicken. Add in cheeses and continue whisking until melted, smooth and creamy. Remove from heat and pour over pasta. Toss to coat evenly. 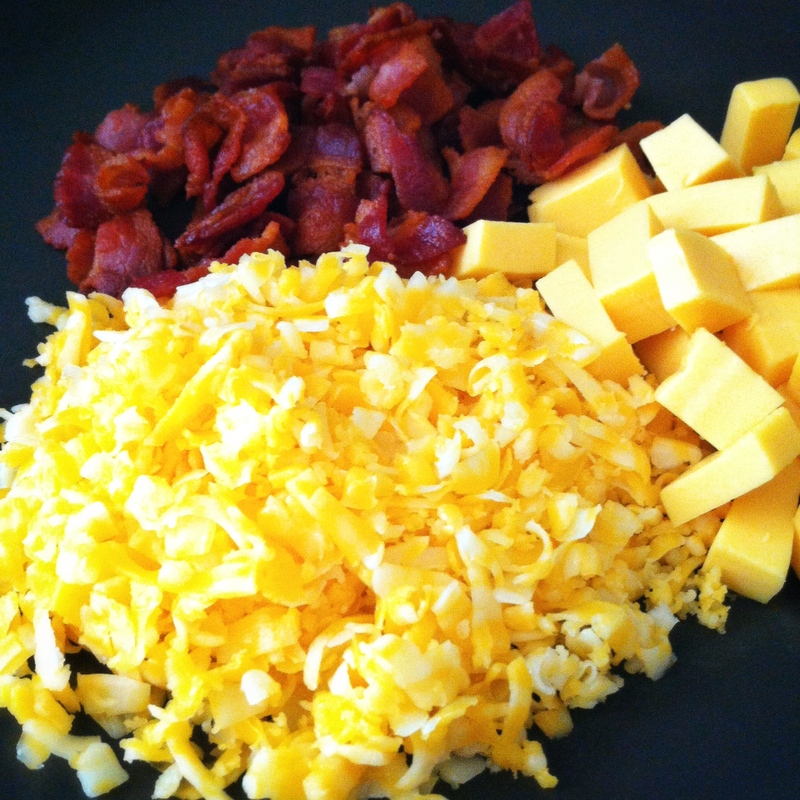 Top with bacon pieces (and if you’re feeling really frisky a little extra shredded cheese.) Cover with foil and bake for 30 minutes. Remove the foil for the last 10 minutes of cooking. Grab a fork. Dig in. Take a nap. Come back. Eat more. Mmmmm. Bacon. Check out http://themacandcheesefiles.tumblr.com, I used this pic for today’s post (with a link back to it of course). This looks fantastic! I didn’t even know that existed…. until NOW! I’ll post that up next week and give you a well defined shout out this time around. This looks fantastic! I just repeated myself! I hate doing that!